Fig. 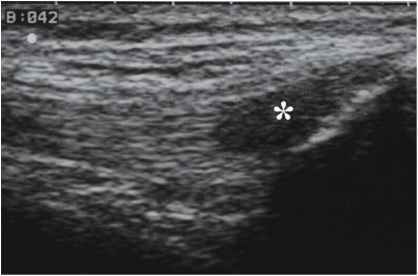 4.44 a, b a This longitudinal scan at the proximal third of patellar tendon shows a partial tear (*) with inflammatory involvement of peritenon (arrowheads). P = lower patellar extremity; B = deep pretibial bursa. b The MR scan of the same patient (sagittal scan,fat suppression technique) confirms the US findings and highlights the inflammation of peritendinous tissues. T = patellar tendon; arrowheads = partial tear by the rotator cuff tendons and particularly by the supraspinatus tendon in which tears are classified, according to the site and extension of the lesion, into: - partial lesions, these can be further divided into: bursal, when the involved aspect of the tendon is in contact with the subacromion-deltoid bursa (Fig. 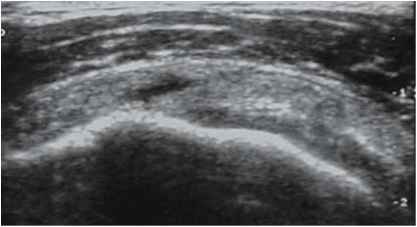 4.45); articular, when the involved aspect is in contact with the humeral head and intra-tendinous.A partial intratendinous tear appears as an anechoic line within the tendon substance (Fig. 4.46). - complete lesions, that correspond to full-thickness tears of the tendon (small, intermediate, wide, total) (Fig. 4.47), with possible retraction of the two stumps. In complete lesions, the humeral head appears uncovered with a tendency to articulate with the acromion (subacromial impingement). Hypo-anechoic fluid collection is observed between the two tendon stumps with a consequent expansion of the subacromion-deltoid bursa [56-59] (Fig. 4.48 a, b).